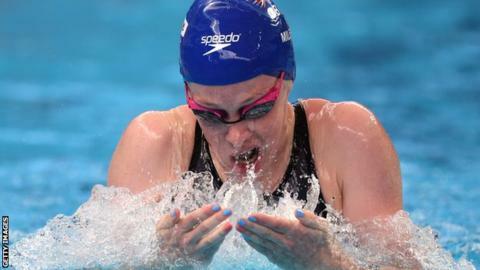 Hannah Miley has apologised for failing to medal at the Swimming World Championships in Kazan, Russia. The 26-year-old Scot from Inverurie finished fourth in the 400m individual medley women's final, which was won by Katinka Hosszu of Hungary. "It would have been lovely to come away with hardware and I know GB was expecting me to so I can only apologise," Miley told BBC Sport. "I am disappointed with that time, but it is one of those things." Miley is the reigning European and Commonwealth 400m individual medley champion in both long course and short course formats. And she finished fifth at the 2012 Olympics in London and in last year's world championships in Barcelona. "Fourth is a lot better than I did in Barcelona so coming away with that is a positive," said Miley, who is targeting a place in the GB team at next year's Olympics in Brazil. "I've just got to park it and move on and the focus is on next year. "You've just got to take each race as it comes, so for me I need to look at the splits where I was at." Last Monday, Miley finished fifth in the final of the women's 200m individual medley. "The heats swim wasn't as quick as I wanted it to be so it might be I raced too much earlier in the week," she said. "The main focus is Rio." Meanwhile, Edinburgh's Dan Wallace was sixth in the men's 400m individual medley final, with Perth's Stephen Milne fifth in the final of the men's 1500m freestyle. Great Britain finished fourth overall in the medals table, with a total of five gold, one silver and three bronze.